Potato salad is always a favourite. But maybe it is time for a bit of variety and try something new, something so summery and perfect for a picnic or a braai. I love potato salad and very few things remind me more of summer than the taste of potatoes smothered in a tangy mayonnaise dressing. Bits of gherkin in between and topped with chopped, boiled egg. Of course, you get many, much grander versions, but give me the down to earth, no-nonsense version any day. It conjures up memories of buffet tables laden with cold meats and salads. Of course, nothing prevents you from having a potato salad in winter, but to me it is just not the same. I always associate it with a long table in the shade of the trees and a long leisurely lunch with old friends. But, to be honest, good old faithful can get a bit boring sometimes. And it is then when I let my imagination take me far across the blue waters to the dreamy islands of the Mediterranean. 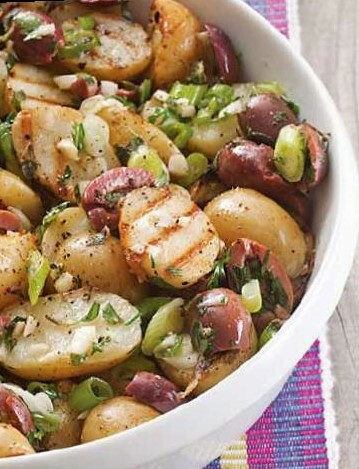 This potato salad was inspired by the tantalising dream of a Greek holiday. Using a mortar and pestle or a food processor, mix the garlic, salt, rosemary into a paste. Stir through the olive oil and pour the mixture into a large bowl. Leave to stand. Cut the potatoes into thick slices and drop into boiling water for 5 – 7 minutes or until just tender. Drain and spread out on a kitchen towel to dry. Put it into the bowl with the garlic mixture and toss to coat. Grill over hot coals for about 3 – 4 minutes on each side. Arrange the potatoes on a serving platter and sprinkle with the feta and parsley. Alternatively, you can thread potato slices on wooden or metal skewers to make it easier to grill. It is also a great way to serve them. Just shorten the boiling time slightly so that the potatoes can easily be thread. Do yourself a favour and visit www.potatoes.co.za for everything you should know about this wonderful food straight from the womb of the earth.